1. Cook the potatoes in boiling water for about 10 minutes until tender. Preheat the grill to high. Scatter the onion and green pepper into a shallow roasting tin and sprinkle with the oregano. Grill for 5 minutes. 2. Drain the can of tuna, reserving the oil. Roughly flake the fish. Stir the lemon juice and plenty of black pepper into the oil to make a dressing. Add the tuna, tomatoes and olives to the roasting tin. Place the feta on top and grill for a further 5 minutes or until the feta starts to colour. 3. Drain the potatoes and turn onto serving plates. Stir the coriander into the hot salad and spoon on top. Drizzle with the olive oil dressing to serve. 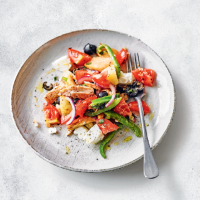 Cook’s tip For a vegetarian option try swapping the tuna for a can of drained beans and make a dressing using 2-3 tbsp of extra virgin olive oil, lemon juice and black pepper.